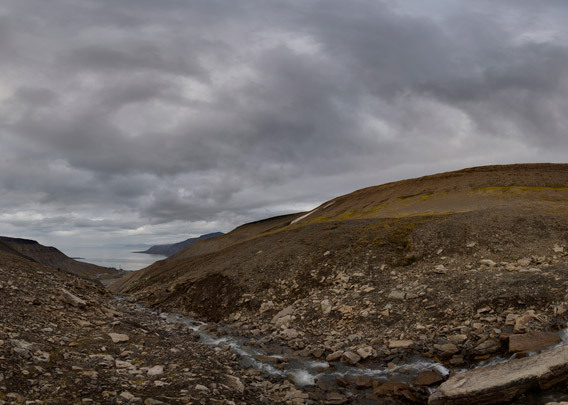 The little valley of Vannledningsdalen on the east side of Longyearbyen is in two ways important: it gives hikers relatively easy access to Gruvefjellet and Sukkertoppen almost year-round (be aware of the risk of avalanches!). Secondly, it is a dangerous avalanche route especially during the snow melt and during periods of warm weather and rain in the winter. Then, catastrophic meltwater rushes and slush avalanches may race down this little valley. The nearby part of Longyearbyen, the neighbourhood of Haugen, has been damaged more than once. The old hospital, then next to the river coming down from Vannledningsdalen, was severely damaged in 1953. Three people died and many more were injured. The risk of avalanches is relevant for these areas until the day today.